What exactly do we do at Camp Rising Sun? Well, actually, a LOT! Campers gather in the Dining Hall for a buffet-style breakfast. Typical fare includes pancakes and bacon or egg sandwiches. Cereal, juice, and milk are always available as well. Campers and counselors partake in a variety of activities with their cabin mates. These could include traditional camp options like horseback riding, kayaking, or archery. Sometimes we’ll mix it up with some karaoke or video games, and arts and crafts with Crafty Patty is always fun, too. We often bring in outside activities as well — things like laser tag, Zumba, or visiting the camp spa! Each cabin’s set of activities is tailored for the campers’ age and gender, and every day is something new and different! After a busy morning, it’s time to head back to the Dining Hall to refuel. We’ll enjoy a variety of hot foods — soups, sandwiches, and chicken fingers are often on the menu. There are always vegetarian options and a scrumptious salad bar available, too! After lunch, it’s back to the cabins for a little R&R. Some of us like to take naps (ahem, Dr. Joe), while others like to read or play a quiet game with cabin mates. After we’re fed and rested, it’s time to hit the beach! Campers can choose from a variety of activities, including swimming in Triangle Lake, taking a ride in a kayak or a canoe, playing beach volleyball, or enjoying whatever wackiness our Program Staff has come up with for the day (cardboard boat making, anyone?). These are usually related to the Camp Week Theme for the year. For instance, during our TV-themed week, campers split up into teams for an all-camp Amazing Race — teams had to work together to conquer various tasks set up around camp. Activities like these give the older campers an opportunity to spend time with the younger ones as well. Time to eat again! Dinner is usually in the Dining Hall, but once a week we head to the beach for our annual beachfront cookout! After dinner, there’s more fun to be had! Typical evening activities might include a talent show, a dance, or perhaps a movie or a magic show. Wednesday night is always our beach party night, complete with live music and an amazing fireworks show! 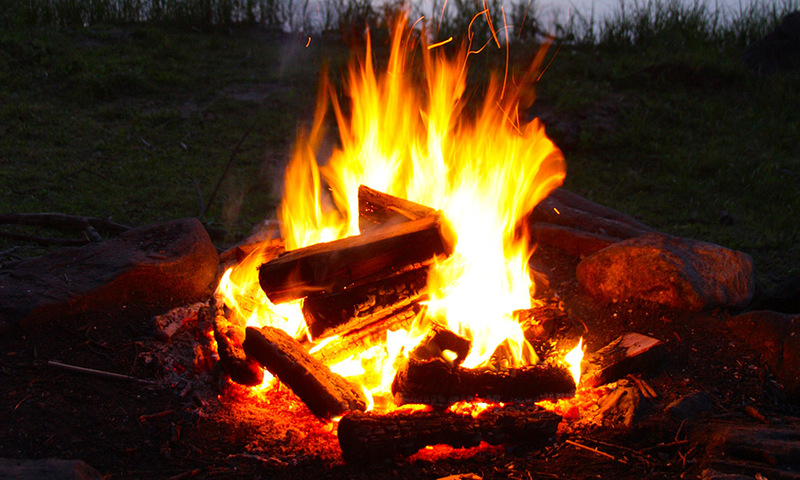 The younger cabins are usually fast asleep by this point, but the older campers might hang out around campfires, roasting marshmallows and hot dogs. Senior Lodge campers can usually be found playing games, making crafts, or just enjoying each others’ company. We don’t want to stay up TOO late because tomorrow’s another fun — and busy — day!